Naim CD555/555PS review | What Hi-Fi? Nobody needs to spend £16,000 on a CD player. However, if that's the kind of funds you have available for your next disc spinner, we have no fears about recommending this Naim two-boxer. Naim's range-topping CD555 isn't a particularly flashy device. Despite chunky styling and a powered top-loading drawer, there's little of the audio-jewellery aura that other top-end CD players possess. This is a music player first, and a status-reinforcing piece of kit way down the line. Like all Naim's higher-end players, this is in fact a two-box integrated. The main unit contains the transport, digital to-analogue conversion circuitry and the rest of the audio bits, while the second box, the 555PS, contains the power supply. Just calling it a ‘power supply' understates the case. The 555PS packs a massive transformer, big enough for most power amps. There are seven regulated power feeds to use between the digital and analogue circuitry – including a separate supply specifically for the digital timing circuitry. Keeping things separate minimises interference and lets each section do its job optimally. Look inside the CD555 and it would be easy to underestimate the engineering that's gone on. 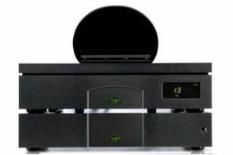 The transport remains a Philips unit, though of a higher grade than that used in other Naim players, while digital building-blocks such as the DAC and digital filter are the same as that used in the £5995 CDS3 (our reference player in recent years). However, it's the details that matter. The casework is chunkier and less prone to resonance. Noise and vibration isolation is better, giving the transport an easier time, which in turn helps performance. Additionally, electronic components are more strictly specified and greater emphasis is put on power-supply purity. None of this might sound particularly dramatic, but compare the CD555 to the CDS3 – both using the 555PS power supply – and you'll quickly hear where the extra money goes. The range-topper is clearly the more detailed sounding of the two, delivering subtleties (even in dense recordings such as Mahler's Symphony No.10) with ease. Dynamics are more delicate and more dramatic depending on what the music demands, and flow in an impressively natural manner. More than anything, though, it's the player's confidence and composure that impress. Difficult discs such as Nitin Sawhney's Beyond Skin are delivered without any hint of effort, but, importantly, without curtailing the seismic bass or dynamic contrasts. And such capability isn't bought at the expense of excitement or musical satisfaction. It's some testament to the consistency of Naim's engineering that the CD555 and CDS 3 share a similarly refined tonal balance and produce music in a similarly cohesive manner. It's just that the pricier player gives you more in just about every way – just as it should, given the difference in price. Yet the feature count is nothing special. Yes, you get both RCA and Naim's favoured DIN connection – don't scoff: make sure you try the din, it usually sounds better – but there are no digital outputs, or balanced connections. Naim's enviable reputation for well-built kit has been hard won, and the CD555 doesn't let the side down: it's wonderfully made and lovingly finished. The player feels as though it'll last for years, and should anything go wrong you've always got the backing of a service department that is happy to support decades -old products. That kind of thing isn't as common as it should be. Sixteen thousand pounds is a massive amount of money to spend on any piece of hi-fi, but with its combination of exceptional sound and fine build, the CD555 makes a strong case for itself. If you really want to hear what's on your discs, there are few better ways to do it – regardless of price.